"OKAY, FIVE MINUTES, BUT THAT'S IT!" In a routine reversal of the famous bedtime stall, a freckled and forceful girl moves her mom along through the familiar bedtime ritual, making her tidy up her work folders and shut down her computer, shoving her upstairs firmly, running the bath and presenting her with her "bath toys" (razor, bath gel, lotions) and giving her feet a loofah scrub that makes her giggle. 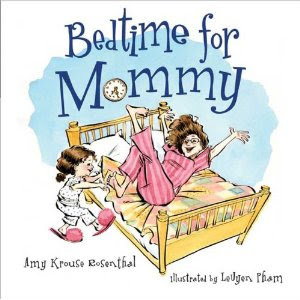 Then it's into bed with a bounce or two for the still wide-awake Mommy, who begs for two bedtime books but has to settle for just one (Anna Karenina). With a kiss, a last sip of water, a this-time-it's-final hug, one more kiss, and endless adjustments to the closure of the door, the frazzled girl heads off back downstairs with a sigh all too familiar to parents. "PHEW! OKAY. ONE DOWN, ONE TO GO." Skillful cartoon-style illustrations by LeUyen Pham set against a white background amplify the action, while speech balloons carry much of the storytelling dialogue in Bedtime for Mommy (Bloomsbury, 2010), a fun and funny role-reversal tale of bedtime travail, with a final page showing the real Mom and Dad peeping in the door as the tired child finally snoozes soundly. A between-the-sheets switcheroo which is fun for both generations in the family, especially at Mother's Day.